It took some time for me to locate a Medcalf & Russell 2M-55 (Gomez FMR-PL17). The re-seller broke up a complete US Conference Mayors Medals set from the Franklin Mint. 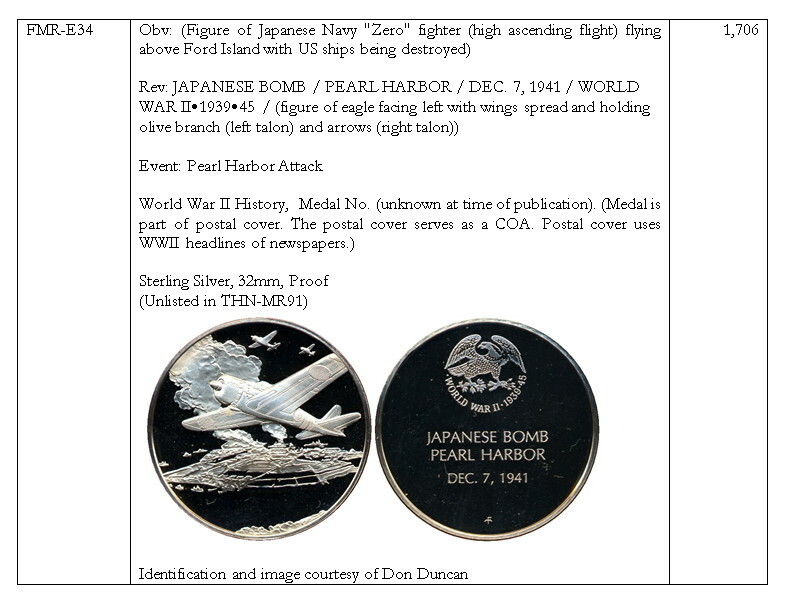 Hawaii related Franklin Mint issues only appear for sale when a complete set is individually resold (intent is multiple price mark-ups on increase inventory or sell the remnants of a cannibalized set). 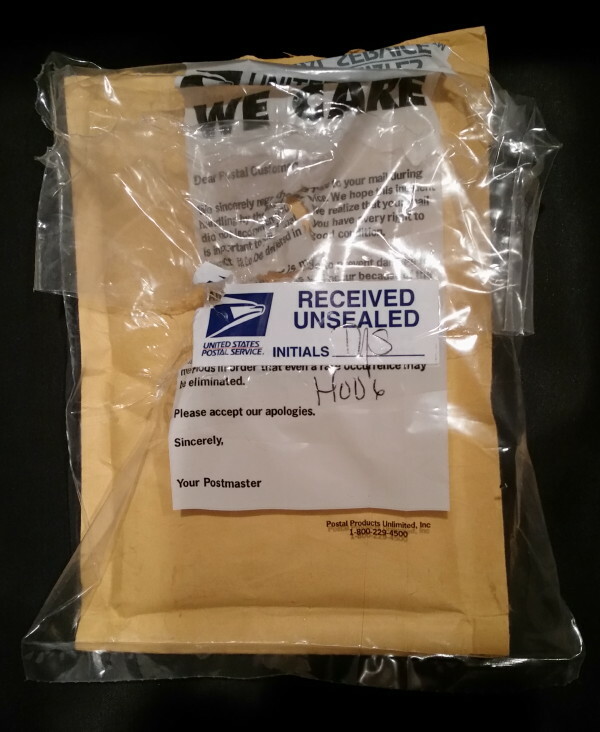 A USPS “body bag” that contained a bubble wrap envelope and a loose medal was delivered to my street address. From my evaluation of the situation, I see that the sealing fold of the bubble wrap envelope was damaged causing a large hole which allowed the medal to be ejected out during shipment. Half of a coin flip was found in the bubble envelope. 1. Always secure the coin/medal in the coin flip or coin cardboard holder. Seal it to prevent it from being dislodged during shipment and handling. 2. Secure the coin flip or cardboard holder in a corrugated safety mailer or place between a folded piece of corrugated cardboard from a shipping box. Seal it to prevent it from being dislodged during shipment and handling. 3. Secure the corrugated safety mailer/folded piece of corrugated cardboard in the mailing envelope. As an extra measure of security, tape the corrugated holder on the inside of the envelope. Filament tape works best. 4. Seal the mailing envelope. 5. Along the four mailing envelope folds, fold on re-enforced gummed paper tape. The gummed paper tape is first moisten and folded onto each of the folds. it is best to overlap the gummed paper tape for a secure seal. 6. Address with water resistant ink. If not, overlap the address with clear shipping tape. If a pre-printed label is used, overlap the address with clear shipping tape (USPS does not recommend covering the label with tape but I normally do it). This re-seller only performed 1 of the 6 steps. A “F” in my book as a coin dealer. As a side note: If the coin/medal is of high value always ship in a box. Entomb the box with gummed paper tape in random patterns. The random patterns allows the applied (stamped) inked USPS dated seal on the gummed tape to act as tamper evident seal. Always verify that the USPS randomly places the inked USPS dated seal all over and at random places on the entomb box. This packaging method can be seen from received items from major auction houses and major dealers. 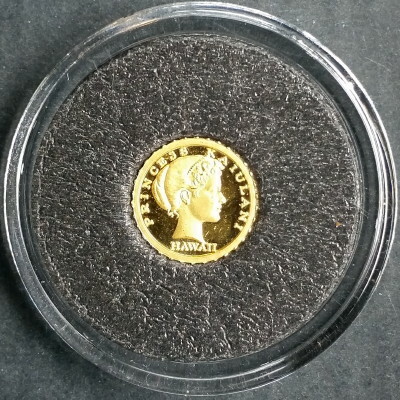 The original version of the book was titled, The Hawaiiana Numismatist’s Catalog of Franklin Mint Issues Relating to Hawaii and was published in March of 2014. Since then I decided to provide a more descriptive title, Hawaiiana Numismatic Issues of The Franklin Mint: Medals, Coins, and Ingots. 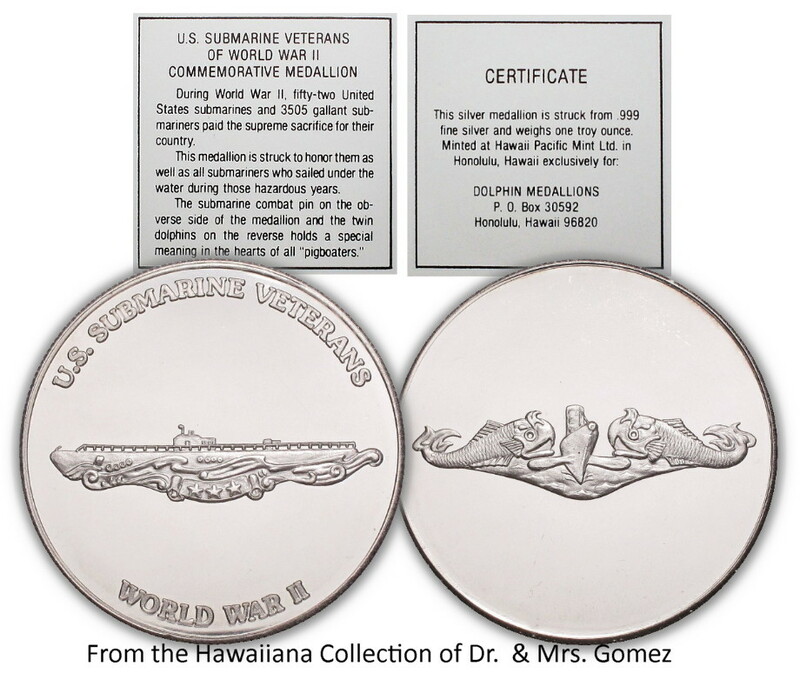 The Franklin Mint issues have been previously integrated into Hawaiiana numismatics. There are a total of 37 medals and 12 ingots cataloged in the book Hawaiian Money Standard Catalog “Second Edition”, 1991, by Medcalf & Russell (MR91). In performing the research for this book, I uncovered a total of 80 Franklin Mint medals relating to Hawaii. These additional 43 medals are not generally known by the Hawaiian specialist/collector, are often overlooked and not collected. I’ve also uncovered a total of 34 Franklin Mint ingots relating to Hawaii. These additional 22 ingots are also not generally known by the Hawaiian specialist/collector, are also overlooked, and not collected. This book fills the knowledge gap about the previously undocumented Franklin Mint issues relating to Hawaii by cataloging these issues. 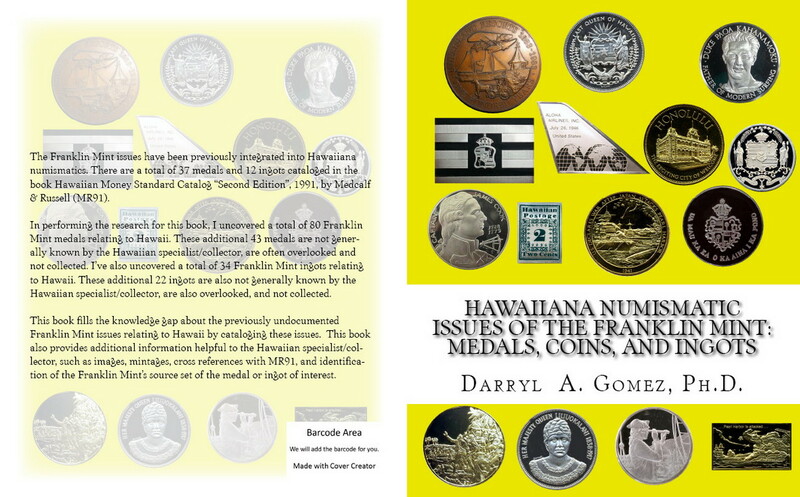 This book also provides additional information helpful to the Hawaiian specialist/collector, such as images, mintages, cross references with MR91, and identification of the Franklin Mint’s source set of the medal or ingot of interest. Book is under review. Release date is TBD. 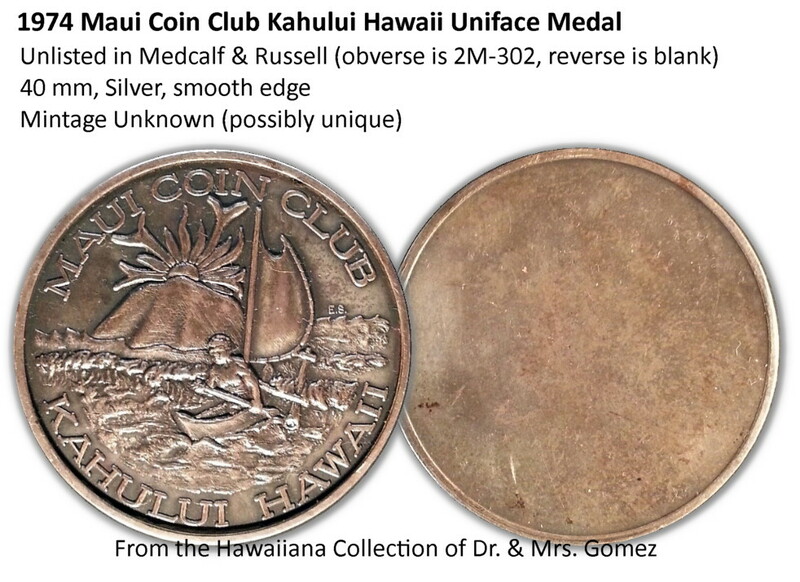 Finally catching up with the updates from Don Duncan and incorporating changes in the 2014 edition (2015 update planned for: The Hawaiiana Numismatist’s Catalog of Franklin Mint Issues Relating to Hawaii). Thank you Don for your contributions. Below is a new medal identification thanks to Don. 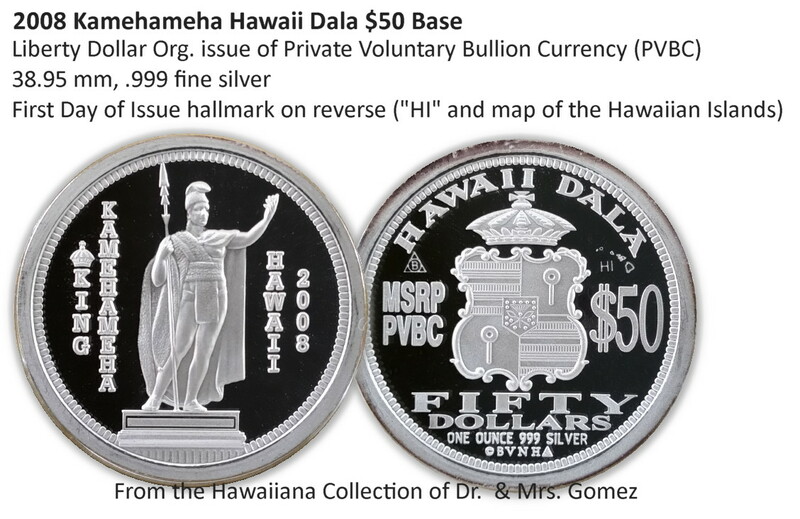 After examining this 10 mm coin I can say that it is not issued from the Royal Hawaiian Mint (no RHM hallmark). However, the Princess portrait and dolphin designs are similar to those struck by the RHM. There is no rim damage to indicate it was a ex-jewelry piece. 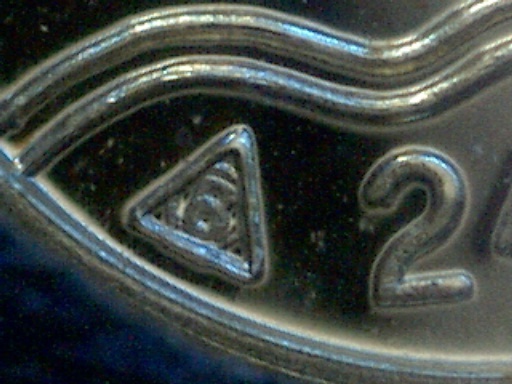 This coin has the triangle circle B hallmarks (design by Bernard von NotHaus) on the reverse. The B is within a circle and within a triangle. Under 60X magnification, it can bee seen that the B within a circle and within a triangle is present. The presence of two triangle circle B hallmarks seems odd. 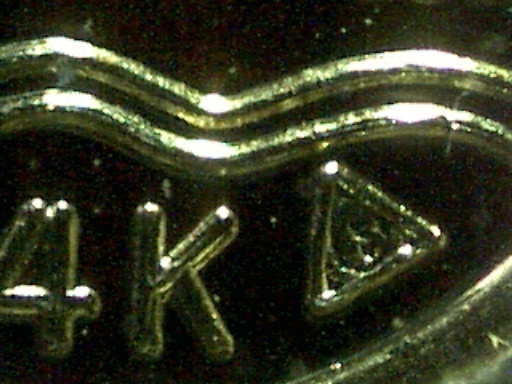 Upon closer examination it was determine that the right hallmark has an incuse circle and B. While the left has a relief (raised) circle and B. This maybe a prototype (pattern) coin stuck by Bernard von NotHaus or by a mint he was associated with (after his time at the RHM). Image is one of the Hawaiian influenced Liberty Dollars. Three versions of this coin exists. 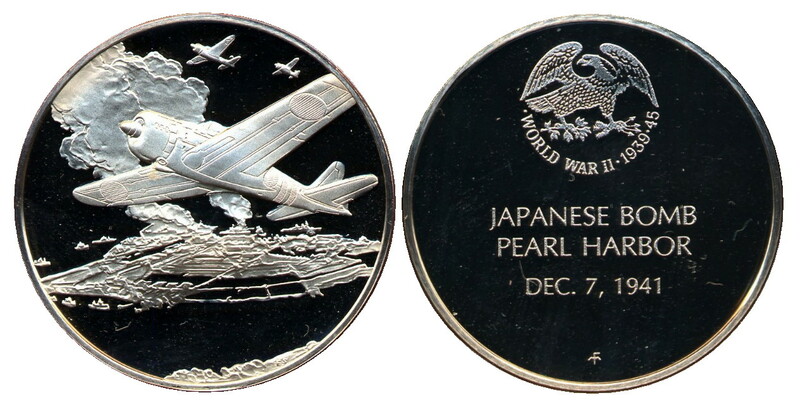 This medal was struck by the Hawaii Pacific Mint. Date struck and mintage is unknown. 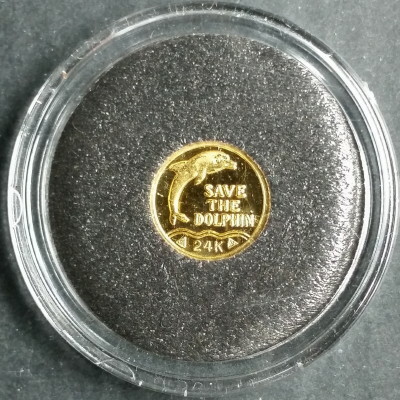 COA provides evidence it was struck by the Hawaii Pacific Mint for a Hawaii-based reseller (Dolphin Medallions).